Then click on the New Flow button – it will open the Flow canvas for you. 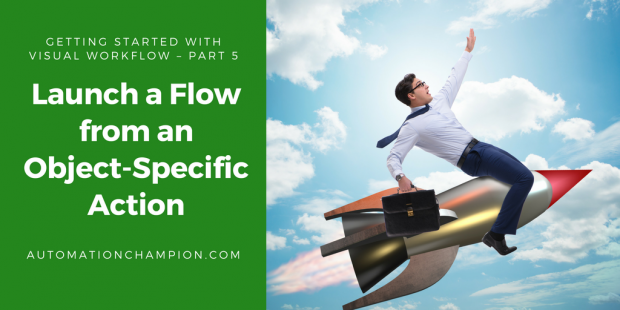 If you want the step-by-step guide to creating the above flow, then check out this article Survey Powered by Visual Workflow. Save the Flow (Type: – Flow) with name Survey and close the canvas. Don’t forget to activate the Flow by clicking on the Activate button. The next step is to create the Opportunity object specific action to launch this flow. Navigate to Setup (Gear Icon) | Setup | Object Manager | Opportunity | Buttons, Links, and Actions and then click on the New Action button. Enter Feedback in the Label field. Name field will automatically be populated based on the Label field. That’s it. The next step is to test this functionality. If you have any problem with watching the video then, please click on it and open it in another tab. I have question regarding setting up a flow for field service mobile app. My requirement is when a Service Appointment is marked as completed by Technician , Technician should see a Q & A flow so that Technician can update the related fields and close the Service Appointment. So problem is since we cant invoke Screen Flows by Process Builder i tried doing this through Auto-launched flows , but the requirement is that the flow has to be invoked by user interaction. Please advise how can we achieve this. If possible to try to override the button and use Flow behind the scene. Is the ebook promo code still the same? “LSVWPB50”? I am trying to purchase the ebook and the promo code is not being recognized by packtpub.com any help would be appreciated!